1. Statement Date/Account Number: Reflects the date the statement was generated and the personal account number of the loan. 2. Account Payment Summary: Provides the minimum payment for the stated month. 3. Contact Us: Reflects the options available to contact us if you need help or information. 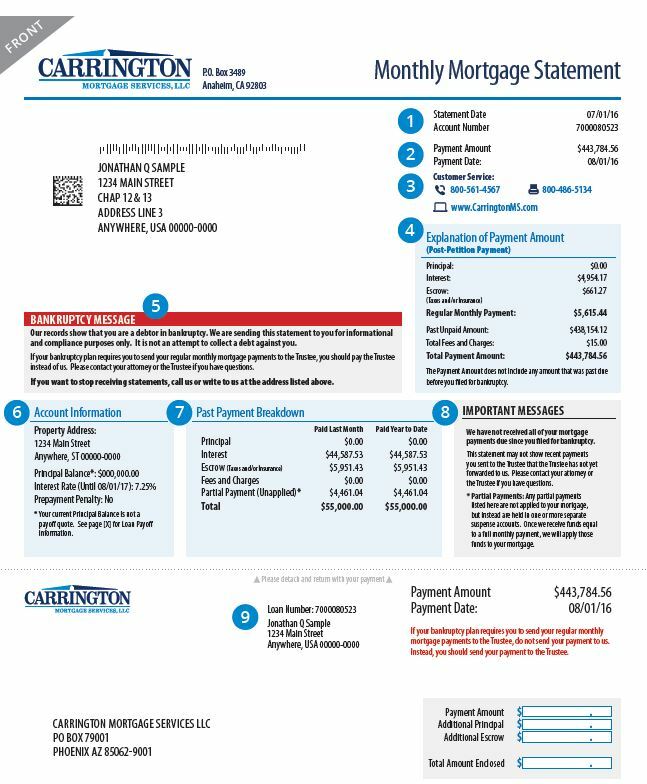 Carrington Mortgage is available to answer your call Monday-Friday, 8:00am–8:00pm, EST, or you can get answers on our website 24/7: CarringtonMS.com. (Post-Petition Payment): Displays summary of the payment amount, including principal, interest, escrow, past unpaid amount, and total fees and charges. Post-Petition Payments refer to the on-going payments required after the bankruptcy case is filed. 5. Bankruptcy Message: Provides statement of account bankruptcy status. 6. Account Information: Provides an overview of the loan, including the property address, principal balance, interest rate, and whether there is a penalty for paying off the loan early. 7. Past Payment Breakdown: Displays a summary of payments paid last month and payments paid year-to-date including principal, interest, escrow, fees and charges. Partial Payment (Unapplied/Suspense): Funds received that have not been applied to the account. 8. Important Messages: Lists important messages related to the status of the loan and payments. 9. Payment Coupon: Provides loan information on a coupon that should be detached and returned with your payment. 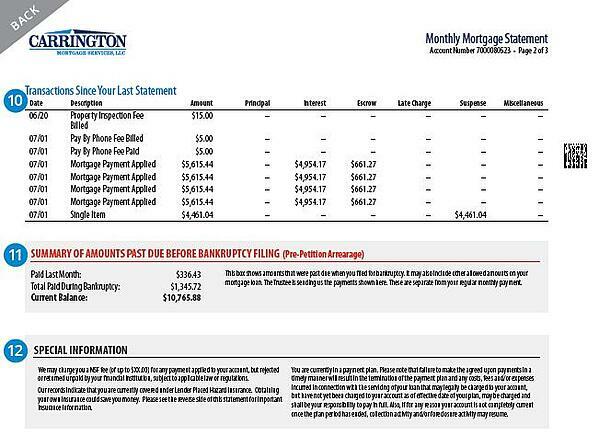 imposed and/or payments made since your last statement. This may also include payments made by your Bankruptcy Trustee. Partial Payment (Unapplied/Suspense): Funds received that have not been applied to the account. 11. Summary of Amounts Before Bankruptcy Filing (Pre-Petition Arrearage): Provides a summary of the amounts past due prior to bankruptcy filing. The payments shown in this box are sent by your Bankruptcy Trustee. These are separate from your regular monthly payment. 12. Special Information: Displays special information regarding the loan.